Our real expertise is working with the owners/directors/partners of small and medium-sized owner-managed businesses. 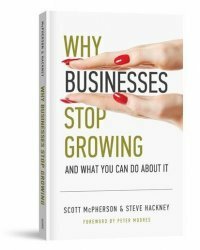 This expertise in the owner-managed business sector has led to us co-authoring our highly acclaimed book titled ‘Why Businesses STOP Growing & What You Can Do About It’ (incidentally the book retails at £29.97, but you can get it for free if you meet with us). But key to us, is to only work with business owners who are serious about building a better business. This is very important to us. Our inspiration, expertise, skills and knowledge are primed for business owners and entrepreneurs who don’t just want an accountant for compliance services. If that’s all you’re looking for, there are dozens of accountants in Ayrshire who can do that for you. Of course until you meet with us – you’ll never really know if we’re suited to one another. So simply Contact Us and we’ll be in touch shortly to arrange our no-obligation meeting. KFMCO are registered members of The Association of Chartered Certified Accountants and authorised to undertake investment business activities, so you can rest assured knowing your financial affairs are in excellent hands.